How can I extend the life of my brakes? 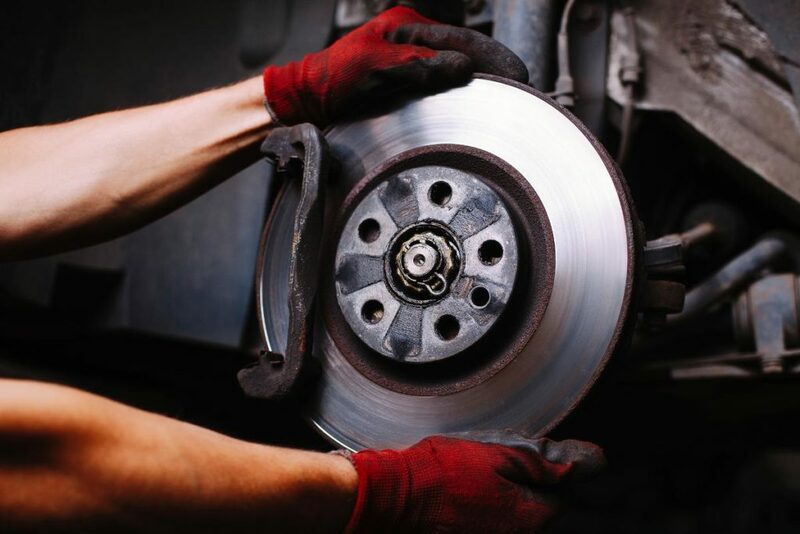 The brakes in your car are integral to the safety of your vehicle, which is why visiting your local Master Mechanic for regular brake service is important. Aside from these regular check-ups, there are also many things you can do to keep your brakes in great condition and extend their overall life. Everyone is great at sticking to their factory recommended maintenance guidelines… for about the first year they own their car. After that, a lot of people tend to forget (or ignore) to take their car in regularly for brake service and other basic maintenance. It is more affordable in the long run to pay for regular upkeep than to wait until something goes horribly wrong. A brake pad is made up of a friction material held by a steel backing. When you press the brake pedal, hydraulic pressure forces the brake pad to grip the rotors, creating friction and slowing the car down. After a while, the friction material is worn down by the heat and friction of stopping. You will probably be able to tell when your brake pads are wearing down. It may take longer to stop, and many modern cars are equipped with a wear indicator. A wear indicator is a spring-loaded steel clip that makes a squealing noise to indicate when you need your brake pads changed. Squealing brakes can also be caused by the pads gripping the rotor too strongly (caused by a number of potential issues), by broken anti-rattle clips, damaged pad insulation or damaged insulation shims. The worst case scenario is that your brakes have worn down to the point that the steel backing of the brake pad is making contact with the rotor. This can cause serious damage to your vehicle and could result in an accident if left unfixed. If you hear brake squeal, take your car to the mechanic as soon as possible. If you’ve ever had the pleasure of driving on the Gardener during rush hour you are probably well acquainted with your brake pedal. But that doesn’t mean you have to slam on the brakes every time traffic begins to slow down. If you are familiar with your route, then start slowing down before you reach areas that are prone to traffic jams. If you are in stop and go traffic, don’t hit the gas and then immediately brake hard. Try driving at a gentler pace. Just because there are 5 meters of pavement in front of you doesn’t mean you have to gun it to fill the space. Coasting is a great way to extend brake life (and save on gas). If you are on the highway and need to slow for an exit, rather than continuing at 100kph and then hitting the brakes, take your foot off the gas well before the exit, and let your car coast until it naturally slows down. Sometimes making a hard stop is unavoidable. If you need to make a hard stop to avoid an accident, then there is not much you can do, and it certainly isn’t worth risking a collision just to save your brakes. When it comes to your car’s brakes, the most important thing is safety. If you have any questions or concerns it is much better to take your car in for brake service, than to find out the hard way that your brakes aren’t working as well as they should.